With the 2017 AFL International Cup currently being held in Melbourne, Ainslie Football Club continue its existing support and ongoing relationship with the South African Lions AFL team. 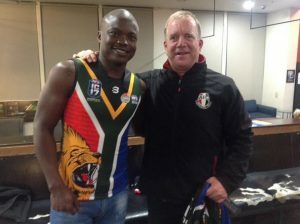 Long-standing Ainslie coach Justin Foley travelled to Melbourne to meet the Lions this past weekend and share the experience his son, Nelson, had when he was selected to tour South Africa with the Under 15 Schoolboys All Australian Team in 2014. Justin also presented the Lions with custom Ainslie Football Club hoodies to keep the team warm as they compete in the International Cup in the challenging Victoria weather over the next few weeks. Ainslie Football Club Coach Justin Foley presents a South African Lions player with custom Ainslie hoodie in Melbourne for the 2017 AFL International Cup. The South African Lions will compete against teams from around the world at suburban and country grounds across Victoria through to August 19th. The annual competition in its 6th year will host both female and male teams comprising solely of amateurs who must be nationals of the country they represent.